Mark Bennett hopes he can be like a new signing for Edinburgh Rugby and bring a real freshness and energy to the club’s crucial end-of-season run in. The Capital men travel to north west Italy for a “must win” Guinness PRO14 clash tomorrow looking to keep their play-off hopes alive while, on March 30, they host Munster at BT Murrayfield in the last eight of the Heineken Champions Cup. The 26-year-old centre made a substitute return from his latest injury setback out of position on the wing in the loss to the Cardiff Blues last weekend. And now he is looking to make up for lost time once again and show the Edinburgh fans what he can really do. 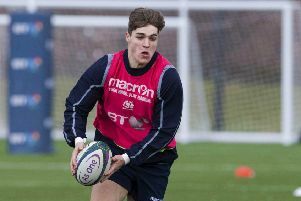 Since he joined from Glasgow Warriors in the summer of 2017 the man with 22 Scotland caps and an Olympic sevens silver medal has seen his career stutter. When he joined he was already a few months into a rehab programme following ACL reconstruction, that injury having occurred at Twickenham against England in March of that year. He returned to make his Edinburgh debut last January, but in September he ruptured a hamstring playing against Ulster and is just back after five and a half months out. “Hopefully now it’s like having a new player coming in, relatively fresh, having not played in months,” he said of his welcome return to fitness. “Myself and Damian Hoyland were in a similar place the whole way through our rehab programme, but we had a wider injured group, so there was John Barclay as well and Senitiki Nayolo, so there’s been a few of us all trying to come back at the same time, which is nice. “We’ve obviously done a heck of a lot of training, but we’ve not played, so we’re coming in fresh with that enthusiasm to play, wanting to be out there playing and running about, so I’m looking to bring that buzz and energy into the squad. “I feel good. I worked very closely with Luke Vella, our strength and conditioning coach who works with the injured players, and Andrew Hay who’s our physio. “They’ve been outstanding and have brought a group of us back in great condition. Obviously Magnus [Bradbury] came back a couple of weeks before me and I thought Damian played well at the weekend as well. We’re fit, we’re strong and we’re raring to go. “It’s not been a great couple of years for me, but it’s part of the sport isn’t it. The ACL was just a freak injury and then I just got caught in a bad position against Ulster, so these things happen. It has been tough, but I just want to get back and get on a run of games and find a bit of form again. After the shock Blues’ loss Bennett knows what is required against Benetton to keep Edinburgh pushing for a top three place in Conference B of the league. 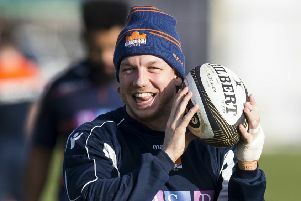 “We need to go out there with a winning attitude; away at Treviso is a tough game and one we need to relish,” he said. “They’re good, a very direct and hard team to break down.